This is the first new recipe I have tried since moving for the second time in six months. This recipe was one that Paul Newman’s mother used to make. What’s Cooking America posted the recipe a few months ago and it caught my eye. It is very delicious, delicately spiced, moist and unique. Kudos to his mom! 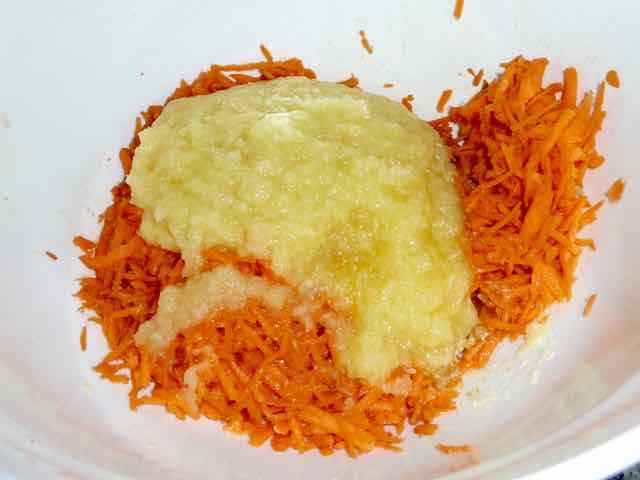 You need to grate the carrots two ways, one coarse and one finer. 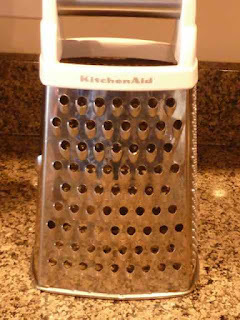 I used my 4 sided box grater. Large grater side for coarser ground carrots. 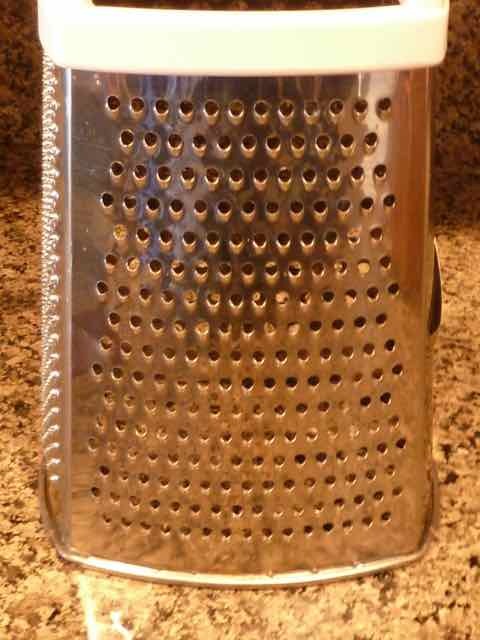 Small grating side for finer grated carrots. The recipe calls for crushed pineapple. I only had tidbits on hand so I ran the whole can (contents only, no metal) through the food processor a few pulses. I may have done too much pulsing as I almost got pineapple juice with thick pulp. I used it anyway (after straining the juice out through a sieve) and the results were great. Everyone loved this cake. I will definitely be making it again and again. ¼ cup + 2 Tbs. 1) Preheat oven to 350℉. Oil a 9x5-inch loaf pan. Place the baking rack in the center of the oven. 2) Peel the carrots. Grate half of the carrots finely and half coarsely. 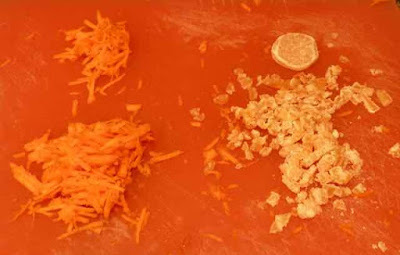 On the left top the finely grated carrots, on the left bottom the coarser grated carrots. On the right one whole piece of crystalized ginger and one ounce of finely diced ginger. 3) Finely dice the candied ginger. 4) In a medium bowl add the carrots, ginger, pineapple and lemon or orange juice. Mix well and set aside. Carrots, pineapple and a tablespoon of juice. After mixing the carrots and pineapple together. 5) In a large bowl or the bowl of a stand mixer combine the sugar and oil. Add the eggs, orange zest and vanilla extract and mix together. Eggs and orange zest added to the oil and sugar mixture. 6) Add the carrot mixture to the egg and oil mixture and mix well. Set aside. nutmeg & allspice. Whisk together well. Dry ingredients in the bowl before whisking together well. 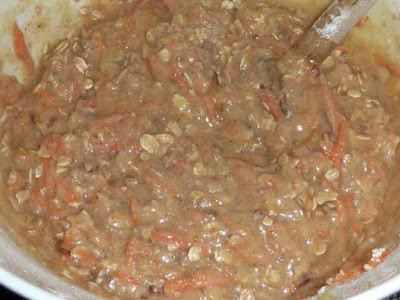 8) Add the flour mixture to the carrot mixture and combine well. 9) Mix in the GF oats & chopped nuts. Finished batter with the oats and nuts. 10) Pour the batter into the prepared loaf pan. Raw batter in the loaf pan. 11) Place into the center of the oven and bake for 50-55 minutes or until the center is cooked and springs back slightly when pressed with a finger. It took more than an hour in my oven, so I loosely covered the top of the loaf with foil after the first 50 minutes of baking to prevent the loaf from getting too brown. 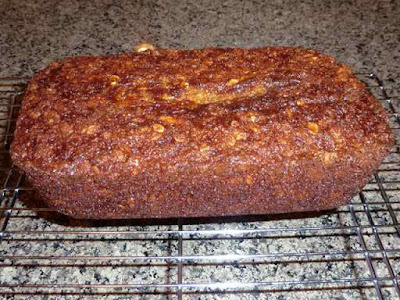 12) Cool in the pan for 10 minutes, then remove the loaf from the pan and cool completely on a wire rack. The baked cake cooling in the pan for 10 minutes. The cake cooling completely on a wire rack. 13) Do not slice the loaf when still hot or it will crumble apart. Cutting the cake while still slightly warm is OK.
14) It will keep 3 days at room temperature. For longer storage, wrap well and freeze. It keeps moister when kept in a plastic bag or airtight container. 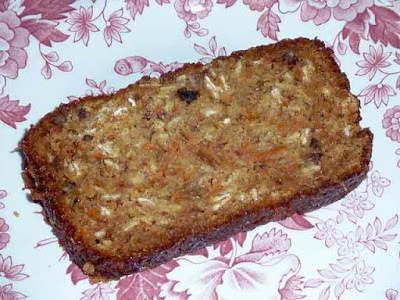 GLUTEN FREE CARROT, GINGER & PINEAPPLE QUICK BREAD Makes one 9x5-inch loaf Ingredients 8 oz. Carrots 4 oz. Crushed Pineapple - juice drained 1 oz. Crystallized Ginger - finely diced 1 Tbs. Fresh Lemon Juice - I used Orange Juice 1 cup Sugar - I used evaporated cane juice crystals ½ cup Vegetable Oil - neutral tasting such as canola 2 large Eggs 1 Tbs. Orange Zest (from about two medium oranges) ½ tsp. Vanilla Extract ¾ cups Sorghum Flour ¼ cup + 2 Tbs. Chickpea Flour ¼ cup + 2 Tbs. Tapioca Flour ¾ tsp. Xanthan Gum 1 ½ tsp. Baking Soda 1 ½ tsp. Baking Powder ¼ tsp. Himalayan Sea Salt 1 tsp. Ground Cinnamon ½ tsp. Ground Nutmeg ½ tsp. Ground Allspice ½ cup GF Old Fashioned Rolled Oats (not instant) ¼ cup Pecans - chopped Directions: 1) Preheat oven to 350℉. 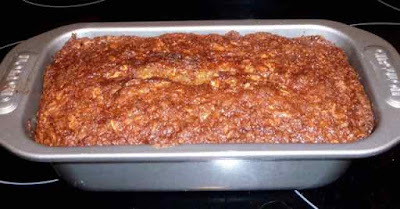 Oil a 9x5-inch loaf pan. Place the baking rack in the center of the oven. 2) Peel the carrots. 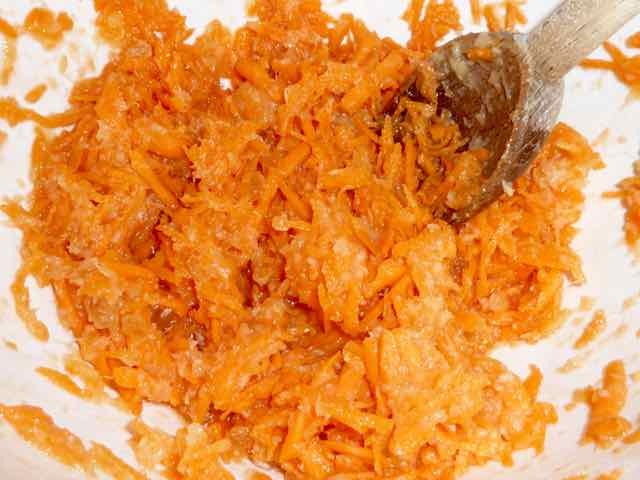 Grate half of the carrots finely and half coarsely. 3) Finely dice the candied ginger. 4) In a medium bowl add the carrots, ginger, pineapple and lemon or orange juice. Mix well and set aside. 5) In a large bowl or the bowl of a stand mixer combine the sugar and oil. Add the eggs, orange zest and vanilla extract and mix together. 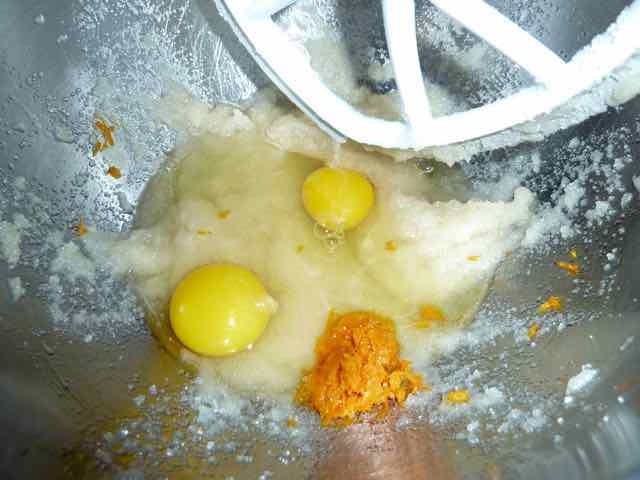 6) Add the carrot mixture to the egg and oil mixture and mix well. Set aside. 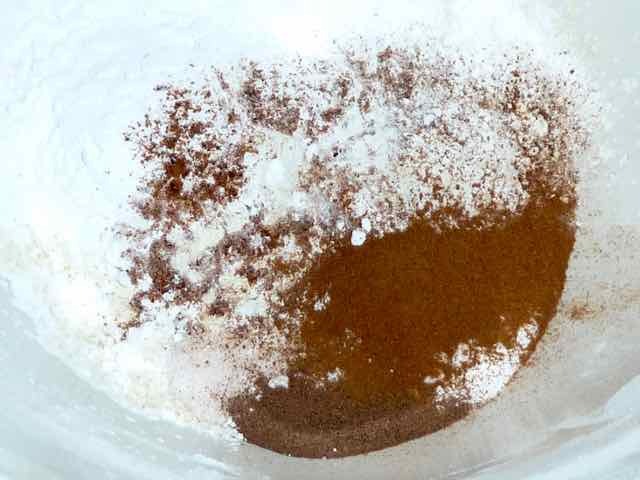 7) In a medium bowl add all the flours, salt, xanthan gum, baking soda, baking powder, cinnamon, nutmeg & allspice. Whisk together well. 8) Add the flour mixture to the carrot mixture and combine well. 9) Mix in the GF oats & chopped nuts. 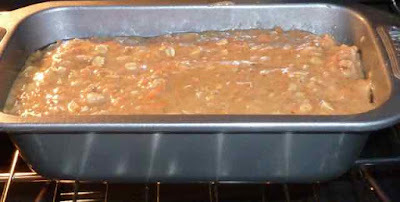 10) Pour the batter into the prepared loaf pan. 11) Place into the center of the oven and bake for 50-55 minutes or until the center is cooked and springs back slightly when pressed with a finger. It took more than an hour in my oven, so I loosely covered the top of the loaf with foil after the first 50 minutes of baking to prevent the loaf from getting too brown. 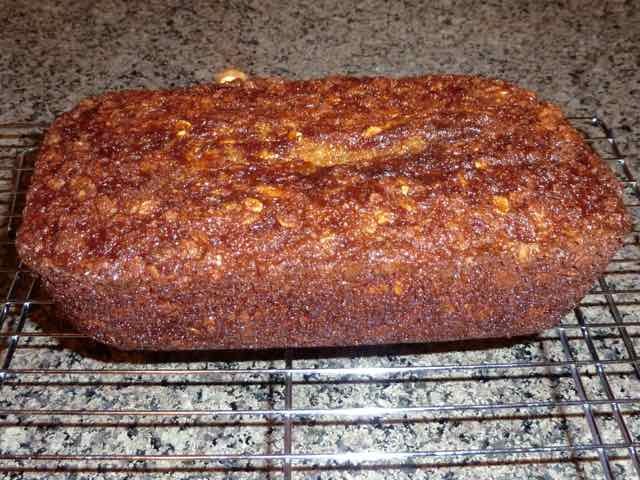 12) Cool in the pan for 10 minutes, then remove the loaf from the pan and cool completely on a wire rack. 13) Do not slice the loaf when still hot or it will crumble apart. Cutting the cake while still slightly warm is OK. 14) It will keep 3 days at room temperature. For longer storage, wrap well and freeze. It keeps moister when kept in a plastic bag or airtight container.